The Statue of Liberty’s crown reopened to the public on Saturday after nearly eight shuttered years. 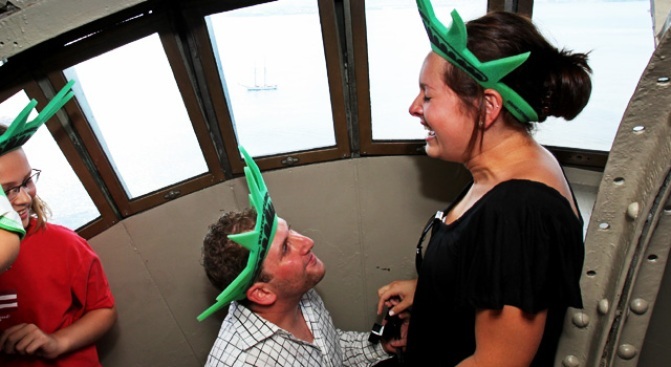 And the hot, cramped climb to the top wasn’t enough to prevent one visitor from proposing. Aww. At the Crown's reopening, a marriage proposal. Amid great starred, striped fanfare, the crown of the Statue of Liberty reopened on Saturday morning, and the first 30 visitors made their way to the summit – the first group to access the crown in nearly eight years (the crown was closed to the public in the wake of 9/11). So, after climbing 354 steps to the top in 80-degree weather intensified by being trapped in a windowless, narrow metal column, how was it? “Absolutely awesome” and “intensely uncomfortable,” the Times quoted one visitor as saying. But not even the threat of heatstroke could obstruct the course of true love: Californian Aaron Weisinger – whose great-grandparents immigrated to the U.S. from Eastern Europe through Ellis Island -- dropped to one knee and proposed to his girlfriend, Erica Breder. She said yes. Both wore green foam crowns at the time. More at NYTimes.com.